It’s a spin-off of a German Euro-calculating site, so please excuse ze langvich, and also the assumption that you have a handbag, ja? From there, it was time to knock up the value to One Bar and have a look at £50 notes and 1p coins (the Samsung method of payment of choice). With 2 strong men, this weight still can be transported well. That’s 12.1kg for each strong man. TWELVE POINT ONE. HOWEVER WILL THEY MANAGE???!!!!?!?!?!? What’s going on here? Is there a problem with the general musculature of German men? Can anyone please explain? 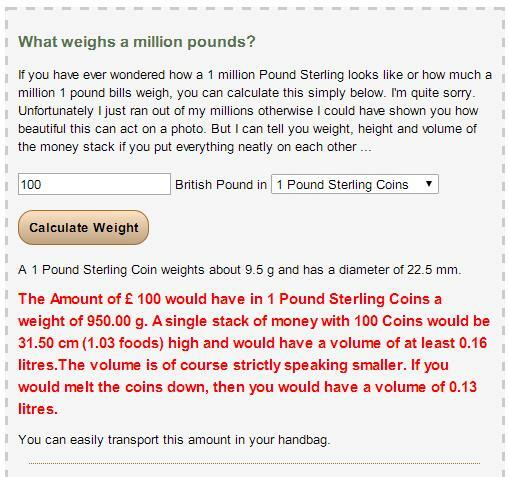 £1,000,000 in 1p coins would weigh a massive 365 tonnes (“For transportation, you should already have a fleet of trucks” – fair enough this time) and a single stack of coins would stretch 165km into the sky. I’ve been doing some rudimentary calculations and I reckon that a tower of penny coins worth £3 million would endanger the International Space Station. Golly. We need someone to do this (make a calculator, not endanger the ISS) for South African currency. I can’t imagine that it would be very difficult for someone with even a basic knowledge of coding. Next Next post: Do you like our new banner?